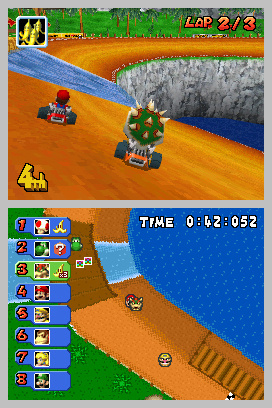 The 2005 hit, Mario Kart DS, marked a new era for Nintendo and its long-running racing series. This particular iteration was released during a transitional phase for the company, with Nintendo beginning to rethink the conventions of gaming. 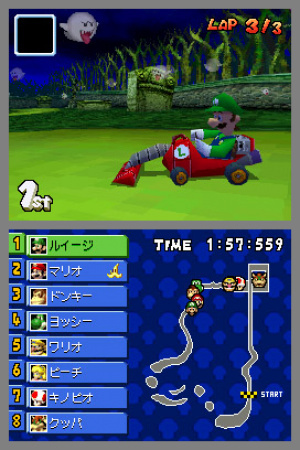 Mario Kart on the DS mirrored this fresh approach, incorporating a portable online multiplayer experience that was accessible to the masses. Not only did this entry go on to become a flagship title for the DS, and one of the best-selling games on the system to match, but to this day it still stands as the second highest-selling Mario Kart of all-time, eventually beaten by its younger sibling, Mario Kart Wii, from the same generation of gaming. With a newfound direction and plenty of accolades, it's clear the DS outing of Mario Kart had a significant impact on the series – arguably greater than that of any entry before it. The title reinvigorated a tried, tested and proven formula that fans had adored for years, and fuelled new life into the series with an even bigger emphasis on multiplayer. Players could now test their kart racing skills against the world. Of course, there was the elephant in the room – snaking – which acted as a vital lesson for Nintendo which was, at the time, still relatively new to the modern online games arena – but more on that later. So, with such a rich history, the question is – how successfully has Mario Kart DS transitioned into the Wii U Virtual Console library? While the majority of the game has aged gracefully since 2005, unfortunately the setbacks are related to the limitations of the Virtual Console. Reality hits hard upon realisation that the core components of what made Mario Kart DS such a success – the local and online multiplayer – are no longer accessible. And with that, a very large portion of experience is gone, raising serious questions about appropriate titles for Nintendo's download collection. With removal of the defining aspects of the original, what's left is a single player mode that offers a similar experience to fellow portable Virtual Console title, Mario Kart: Super Circuit for Game Boy Advance. Thankfully, the solo mode in the DS version is slightly more groundbreaking with the addition of a series first – Missions – where players test their skills in a series of driving challenges and face off against bosses, and a more enticing Battle mode – making use of CPU opponents and featuring two thrilling scenarios – called Shine Runners, and also the ability to blow balloons with the Wii U GamePad microphone (one of the few features that has remained intact in the Virtual Console port) in the standard Balloon Battle. Added to this is a VS mode against CPU players with plenty of track, kart and player customisation, a classic Time Trial mode (now limited to just the system and staff's ghosts), and then the usual Grand Prix mode with its familiar engine classes, while aiming for podium position and a three star ranking. 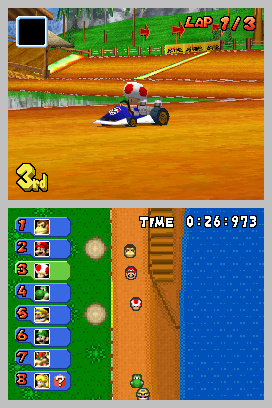 What remains of a stripped back version of Mario Kart DS is still admirable in terms of overall quality. There is plenty of content to work through as well, much like classic entries in the series. At its core, the DS version is a refined experience offering 36 karts, 12 diverse characters – not including the now unplayable Shy Guy (a Download Play exclusive) – and for the first time ever 16 retro tracks (excluding the GBA title which featured the entire catalogue of Super Mario Kart tracks) alongside 16 new tracks designed with the specifications of the DS in mind. And don't forget the new Missions mode broken into seven levels with each containing eight tasks ranging from coin collection, mini-turbo challenges and then the boss battles against archetypal Super Mario enemies. One other feature still available in all of its glory in the Virtual Console port is the infamous snaking mechanic, where the player drifts and boosts repeatedly to gain a permanent speed boost. At the time of the original's release, this ability had a love / hate relationship with players – particularly in the online connected modes, with some players claiming it completely destroyed the game, while others believed it was a mechanic there to be taken advantage of. While snaking is still available in the Virtual Console re-release, the absence of online or any form of multiplayer makes this significantly less of an issue. The only advantages from snaking are now better lap times or getting the jump on the volatile CPU opponents. In terms of course offerings, MKDS features some of the most memorable in the series, including the likes of Peach Gardens, Delfino Square and Cheep Cheep Beach. On release, there was no limit to the variety of retro offerings, ranging from SNES to GameCube tracks, including courses such as SNES Mario Circuit, N64 Moo Moo Farm, GBA Sky Garden and GCN Yoshi Circuit. The new and old selection of tracks are all well constructed, with thoughtful design and unique themes. They never become tiresome but only get better over time as players fine tune lap times with tighter lines around every bend. The controls in the digital variant of MKDS are limited to the Wii U GamePad; fortunately the title's buttons are mapped appropriately to the GamePad's design. There is also the option to use an analogue stick, though traditionalists may find themselves sticking with the control pad. Either way works fine outside of snaking. The lower touch screen of the DS also fits perfectly on the GamePad. For Mario Kart, it's mostly useless outside of the emblem maker, which is still active. The related screen settings in the Virtual Console menu also allow users to select from a left and right hand touch screen setting; users can choose between different displays as well. 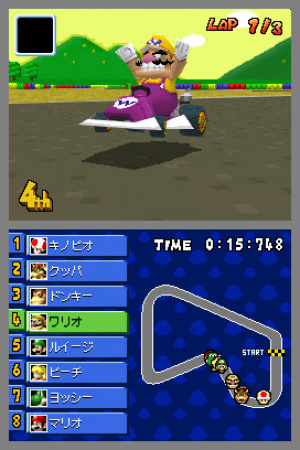 There are options to show both the touch screen and top screen on the television and mirror the picture on the GamePad, flip the screens left and right, display both screens in a vertical fashion mirroring on both screens, emulate the shell of the DS (again mirrored on both screens, which results in very small screens on the GamePad), and lastly, enlarge both screens on the respective television and GamePad. Visually speaking, the portable MKDS does not exactly look flattering on a modern high definition television when upscaled. To compensate for the heavy amount of pixelation, Nintendo has thrown in a screen smoothing option, much like the one featured in GBA Virtual Console titles. The feature blurs over the pixels. Regardless, players are bound to find screen options they prefer, and one that suits their own setup. In the VC options there is also the standard save state feature and a full coloured instruction manual to flick through – although, as noted, many parts of the booklet may just be teasers for parts of MKDS players can no longer experience. Lastly, the sound and music in Mario Kart DS carries across nicely to Virtual Console, with familiar music and sounds from the Mario series. These upbeat, nostalgic and catchy tunes are nicely mixed with a modern and cutting edge vibe that match the nature and period of the game. When Mario Kart DS was originally released it was flawed perfection. Everything was in check, yet the key focus of the title – connectivity – was troubled by snaking which was rife throughout the title's entire lifespan. It acted as a vital learning lesson for Nintendo at the time. Despite this flaw – often deemed as a major error – this entry is still much loved by veterans of the series. 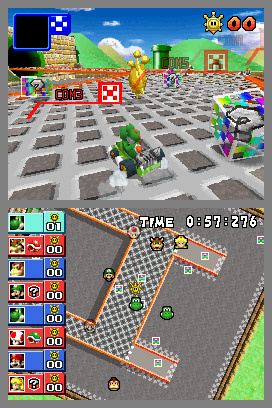 In many ways the Virtual Console edition of Mario Kart DS has now created its own separate series of problems with a lack of local and online multiplayer. As a result, Mario Kart DS rates as one of the most unfaithful Virtual Console recreations currently available within Nintendo's digital catalogue. This release is not necessarily a convincing start to the DS Virtual Console, either. The single player experience is still worth a look for casual observers of the series – providing a solid sample of what the original offered, but just be aware that, without the multiplayer, a fair chunk of content is missing, and the heart and soul of what made the game so brilliant during its prime is no longer there. Lighting strikes twice as Nintendo once again enter new territory, with new questions raised about what games should and should not be made available in Nintendo's Virtual Console collection. While the GBA Virtual Console iteration of Mario Kart also suffered the same fate with inaccessible multiplayer, the effects are magnified here due to the nature of Mario Kart DS and the era it was from. I wish it had multiplayer with the DS/3DS versions of the game, now that would be cool. Would of taken you an afternoon to amend the game to connect to Nintendo Network for online, AN AFTERNOON. I still don't get why the Wii U is getting this and not the 3DS. Sure you could just buy the cartridge and still play it on the 3DS, but even so, I don't get it. The upscaling on a large tv just sounds awful. I still find it strange these games get re-reviewed. They're not ports or remakes, so there's nothing different to when it was originally released. People should know by now that Nintendo aren't going to go into the code to make multiplayer work. They just dump the rom. This is still my favorite DS game of all time and I never played multiplayer. Mario Kart DS was definitely the best in the series until 8 came along. This gets a perfect 10 from me. Best battle mode by far, and mission mode needs to make a serious comeback. My favorite Mario Kart game before 8. @Phantom_R How could you give it a 10 when there is no multiplayer on the Wii U version. @Franklin The whole point of the term is that it's an oxymoron. I'd say the lack of a D-pad in a 3D Karting expedition is more of a flaw than the single player excapade. Since DS and Wii wifi are both now turned off permanently, there is not much to add with the original game that's not present in the VC edition. I just can't stand this game. The lack of analogue controls made this game much more imprecise than it should be, and while none of the tracks are built in a way that a stick would actually be required, I still constantly noticed how much this imprecision was holding me back from utilizing my full experience. Also, the driver/kart balancing was just plain awful. @Phantom_R I don't really mind it either, but in all honesty, that barely matters. The very option is unavailable, which drastically cuts down the replayability, considering how much multiplayer focus MKDS received. And the whole point of oxymora is that they're nonsensical. i.e not to be used to evaluate things, like games for instance. I think I'm done with Mario Kart in general, couldn't even stay into MK8 for more than a month. (didn't even bother with DLC) That said, what they should do is use the internet to play "locally" with people on your friends list. Maybe it is just me but I rarely play Mario Kart in multiplayer so the lack of support for that wouldn't concern me at all. I still have my original cartridge though so I won't be picking this one up anyway. It does make you wonder why Nintendo even bothered to release this game at all with Mario Kart 8, Mario Kart Super Circuit, and Mario Kart Wii already playable on the system, though I have to admit that Mario Kart DS was a particular favorite of mine due to the single player content alone. @Sanya But thats just online then and would require servers so why not just make the online function instead, lol. Never would've used online or multiplayer if there was one. Everyone I play with would much rather play the newer entry, MK8 so it was never really a problem to begin with. So, yeah, I'll probably still get this at some point to expand my knowledge of Mario Kart. Nintendo would have gotten a lot more sales if they included local and online multiplayer, as this is one of my favorite Mario Karts. I guess that would be too much work. Oh well, I'll probably stick with my original copy. This is probably still my favourite Mario Kart... loved the single player missions. The loss of multiplayer doesn't bother me, rarely ever played it anyway. So for the start of the DS and N64 virtual console, these are the games released for the three main territories. US- (2 games) SM64 and Yoshi's Island DS. Japan- (3 games) DK64, NSMB, and Brain Age Academy. Europe- (4 games) DK64, SM64, MKDS, and WarioWare! I would definently prefer to live in the UK for the sake of DK64 and more options. I live in the US, so NOA, step it up! Why is this under DSi instead of Wii U? @Franklin "flawed perfection" is an oxymoron, think jumbo shrimp. It's perfectly legitimate English. @Sanya Yeah you basically described online, it would have been neat if LAN party acted as local multiplayer but given the fact you need and accessory for ethernet support I doubt it would be worth the time. @Hero-of-WiiU Sad thing is DK64 in UK/EU is the 50hz version so I'd much rather wait a week or two for the 60hz one. You guys got a better DS game for the first in the VC lineup than we did. Yoshi's Island DS can't play very well in ANY of the screen settings. I wish Nintendo bothered to increase the native resolution of their VC library (mainly N64 and DS titles). I'm not asking for improved textures or even widescreen support (as this could prove problematic for some games as all N64/DS games were designed with a specific aspect ratio in mind), but just an increase in resolution. Never heard the term 'jumbo shrimp' but it seems every bit as vulgar. I remember being floored by the graphics when this came out. McDonald's had free wifi at the time, so I got dropped off there once so I could play online, and I was all, "I'm going to come here and play all the time!" and then I saw that every single game was just me and seven other players snaking past me. Every last one. So I stopped trying. Also, BRING BACK CHALLENGE MODE! It's the reason this was the last Mario Kart I've ever felt was worth buying. This is the entry that got me into Mario Kart. I never cared for the series before this, and I remember going into buying this thinking that I'd probably not enjoy it that much. It ended up being one of my favorite and most played DS games, which says a ton considering I have several DS games that I put in over 400 hours into. I barely touched online play outside of a few forum-run tournaments and I only got the chance to play local multiplayer a few times. I still have my cartridge so there's no need to pick it up, but this stands as the best MK at time of release when you look at all of the single player options available. Lack of multiplayer is a complete non-issue. Best Mario Kart ever. Snaking is only a 'problem' if you're not skilled enough to continually pull it off. The game overview is still claiming this game is for 8 players and features wi-fi connection, lol. Mario Kart DS was one of my favorite DS games. I spent many hours playing it with my brother (a huge fan of snaking), along with the original NSMB's mutliplayer. The lack of multiplayer on the VC was expected, but is extremely disappointing nonetheless. I probably won't buy this anytime soon. $10 is pretty high for what amounts to half of a ten year old game. actually, "Jumbo Shrimp" isn't an oxymoron. It's a label/name describing the size of the shrimp. The word shrimp in that context isn't being used as a size adjective but as the creature's name. Edit. Having looked online some sources do consider Jumbo Shrimp to be a oxymoron. But I think that is playing loosely with the Def of an oxymoron given that it's creatures name in that instance and not a size indicator. I loved snaking. Whiners just need to git gud. I'm good at snaking, but that doesn't mean I like it. I enjoy playing a good fair game of Mario Kart with everyone. Give me Chrono Trigger for DS on Wii U Nintendo! @Franklin Perhaps you should do some self-study of the english language before you ask Nintendolife to be the educator. Start with googling Oxymoron, then move on to Ironic and then re-read your post. I like the virtual console release. It is just an emulation so you can expect certain limitations. What I do wonder is whether Nintendo implemented the emulation of the wireless communication of the DS. After all, you can still try to connect to Nintendo WFC. It might still try to connect to the now-offline servers, although that might be farfetch'd. I guess I could try to capture the network activity, but I can't be bothered to be honest. Mario Kart 8 is much more entertaining if you ask me. Even though it lacks the extras like missions. It wasn't the lack of multiplayer that was the dealbreaker for me. It was forcing you to use the gamepad even though this game barely ever uses touch controls that made me say "I'm not buying this". Why is Nintendo so adamant about making me use a controller that makes my hands and arms ache for hours after using it?! Without multiplayer that game is annoying and boring. Dont even bother to buy this. There's no better example as to how Nintendo will never make everyone happy than this "No Online" outrage. Mission Mode was something that I really liked in this game and missed on the following Mario Kart games. But I don't think I'll buy it, Mario Kart without multiplayer isn't worth a lot to me. @Liam_Doolan In your review you're making it sound as if the online mode would still work with the cartridge version, which nowadays it is not. So you can't really fault the VC port when in fact the shut down of the WFC is responsible. So the only thing that's really missing in the VC port is local multiplayer (which personally I never used anyway). I never had MKDS, so I might consider giving it a shot anyways. Still, while I can forgive the lack of online mode, the lack of close-multiplayer, is one of the reasons I don't think DS & GBA games work well on WiiU. TV games can only have one, or two screens on it at a time. (Taking the WiiU game pad into account.) And it might be difficult to emulate 2 or 4 simultaneously running DS/GBA systems all at the same time, and it'd be difficult to fit them all on one, or two screens. Considering 3DS NES & Game Gear games have multiplayer, it'd be easier to recreate/emulate the multiplayer feature on 3DS, as it's a portable like the GBA & DS originally were offering multiple screens/systems, so it'd be easier to emulate their multiplayer on them. I really don't know what Nintendo was thinking having portable games on a console. Seems like just something they did sense they couldn't get GameCube games to work on WiiU's VC, and were desperate to have new consoles for it. @Angelic_Lapras_King Agreed, though to be fair some Square/Enix-owned games like Final Fantasy, and "Bubble Bobble" (yes they own that now) were released in Japan for WiiU & 3DS VC. @Phantom_R 99% of my Mario Kart experience is single-player, since I only get to meet up with my friend twice a year at most. Still, I have a lot of fun playing each MK title, even without other human drivers on the track. This was the perfect introduction to the DS for me. I must have played the single player mode for a thousand hours - I never touched the multiplayer. This may be my favourite Mariokart ever (it's still the best handheld Mariokart ever), though it hasn't aged extremely well. Mario Kart 64 is more fun, but MK DS has more content! No reason why Nintendo couldn't implement local multiplayer atleast. I guess the same reason why their N64 emulator doesn't recognise Donkey Kong 64's 16:9 WIDESCREEN or Dolby Surround. Nintendo really are useless when it comes to providing the complete package. They always fail miserably somewhere. The lack of multiplayer kills the point of mario kart for me.surely they could've added online multiplayer but then the issue of snaking would ruin it anyway.I think this should've just not been re released. @Beau_Skunk Please don't confuse 'challenge' with the 'cheap and lazy' option. Nintendo as usual have went cheap and lazy. Adding DS multiplayer to this would be incredibly simple. I can download a better Indie DS emulator on my Android phone for christ's sake. @manu0 Don't get me wrong, I love Nintendo games and Wii U but I'll give you another year before your blinkers come of and you stop defending Nintendo for their inept oft dispicable practice. Their sillywilly approach to emulation disgusts me. Any wonder why people turn to piracy. Even Donkey Kong's 16:9 widescreen and dolby surround options are not recognised, a game I played in widescreen on release in 1999. Give Nintendo the reigns and I CANNOT play widescreen in 2015 It is pathetic. @liveswired I agree that Nintendo takes the route of minimal effort when it comes to the VC, other companies like M2 are much better. But the subject of my comment was the missing online mode which, again, is not a fault of the VC port, because the cartridge version doesn't have a working online mode either. I never had a DS, and by the time the 3DS rolled around "Mario Kart 7" was just around the corner, so I never saw any reason to get this one. Without the multiplayer modes, I still see no reason to get it. @sillygostly All Rare games were designed with 16:9 widescreen in mind starting with GoldenEye in 1997, nearly 10 years before Nintendo accepted widescreen was common place. It is a very simple issue for Nintendo to resolve. Give us the option to choose the aspect ratio or even cropping in emulator - even if that means stretching a 4:3 image, but it also means I can play games with widescreen options in widescreen. Will we see Wii U games emulated by Nintendo in 10 years time with black borders? I am tired of Nintendo patriots spreading misinformation about N64 titles to save Nintendo face. Many non Nintendo developed N64 games featured true 16:9 widescreen options, and as I said - ALL post 1997 Rare N64 games did, sometimes Rare even threw in true cinematic and scaling options just for fun. Nintendo themselves refused to support widescreen and were in denial until they were forced to due to increasingly disgruntled fanbase with the Wii. 480p was even was a final hour patch on the Wii before release! Fan pressure is what is needed - not obedience! The fact also remains that Rare developed N64 games were a generation beyond Nintendo developed titles throughout this era, Rare were so far ahead of Nintendo in graphics and sound technology it was insane! @Fidu With you there kid. Snaking was a genuine skill, it separated real skilled Mario Kart racers from those who just relied on luck. I was a master of the technique itself on DS and GCN. The competitions one of my friends and I used to have were intense! No kidding. Just played some Double Dash with a few friends a couple weeks ago, and they were kind of irritated about how effective it is. If they get their blue shells and lightning bolts, then I should get my snaking. It's absolutely pointless to release a Mario Kart game with no multiplayer support, Virtual Console or no. Seriously, what were they thinking? They could've picked any of the DS's amazing library to start off with and chose Mario Kart DS and Yoshi's Island DS instead, arguably the two worst titles in their respective franchises (at least if you subtract multi-player from MKDS)... And the worst part is people will still buy them because they have "Mario Kart" or "Yoshi's Island" in the title. @vonseux It really couldn't. Not even emulators have online. whats is this "snaking" stuff many speak of here? Removing online is such a deal breaker... C'mon Nintendo. Often the oxymoron is trite, as is the case here, and the irony disposable. I just want Mario kart double dash on wii u is that too much to ask? Gonna have to pass on this. @DontPlayDumb Sounds just like your username. You'd be stupid and dumb to buy this for online because of snaking and cheaters..
@Phantom_R I agree with you, but not being able to play the multiplayer battlemode with other people is kind of infuriating. Ah, the snaking mechanics. Half of my matches online ended when the opponent rage quitted (sadly you didn't get a win back then when your opponent did so). Snaking made the game challenging and super fast. One of the best Mario Kart games. And I spend some time in Time Trial mode too. Mad to not include multiplayer, surely some recognition of this and a discount is in order as you're really not getting a full game here? No Multiplayer = no buy. I still have my Mario Kart DS game card, I can still play it just fine on a DS or 3DS. Reviving multiplayer would have been a reason to buy the game again on Wii U, but without it, it's a massive waste of time and money. Forget 7/10, give it 3/10 for being the obvious shameless cash grab that it is. Charging full price for half a game, ridiculous. If they're only going to provide half the game, they should cut the price in half as well. @Franklin Agreed. Oxymorons like that are bad writing. @FlaygletheBagel Yeah, Yoshi's Island DS was also a terrible game. Why pick a crappy Yoshi game and a Mario Kart with half the content missing? Because Nintendo. That's the only explanation. Because Nintendo. Now get out of their way, they have more copyright infringement to dish out to innocent YouTubers because they've never heard of Fair Use. I was extremely good at snaking and consistently broke time trials records and won online races (except when AR cheaters were playing). People who were complaining about snaking being a cheating technique/not being able to do it always confused me because it was relatively easy to learn and pull off with minimal practice. It isn't a glitch; just because it wasn't an intended technique doesn't mean the player is exceeding the limits of what the game is allowing them to do. There is no glitching or hacking involved. @MoonKnight7 it doesn't look any worse then minecraft does. Also, ur right just get a cartridge. I like digital, but it's pointless in some cases. Besides, why would Nintendo bother when people are just playing 2 other versions online? 3ds and wii u. It's just good to play the single player tracks. Then go back to mk7. Good rewiew but still needs more negatives towards Nintendo aproach to gaming. If more reviewers score Nintendo games badly due to lack of online or voice chat. Nintendo will buckle and add them. It's just that games which focus on these features still get 10/10 from reviewers that Nintendo feel that adding voice chat and online won't effect the score so no need. This is the worst Mario Kart imo. Online was horrid, graphics were horrid, everything was horrid. But I was not a fan of the DS, they can keep this one. Lets move on to something more interesting already Virtual Console! Why Nintendo would even waste time on porting Mario Kart DS to the Wii U when the 3DS has the superb Mario Kart 7 and Wii U has the incredible Mario Kart 8 is anyone's guess. Nintendo's oddball business culture is definitely the Idiot's Parade. Even more so, I don't understand why they'd waste time porting any handheld game to be played on the Wii U, tablet controller or not. I know about cheaters. You can play online "normal" since DSI because got wifi "g" and normal encryption. But this not excluded cheaters. @c1pher_c0mplet The only handheld ports worth doing are 3DS ports. Zelda, Star Fox et all would look pretty fine in 720p with 2xAA. The DS is a different kettle of fish - incredibly low quality polygons, 256x192 resolution, low texture quality and no filtering - it looks like trash on a 3DS screen let alone a HDTV. N64 games scale very nicely - particularly Rareware games which were always crisp with excellent texture work and usually 640x480 res to begin with. But again we see Nintendo refusing to bother supporting 16:9 in titles that had it to begin with [DK64]. I really don't see why Majora's Mask 3DS isn't a Wii U download title either. Downloaded this for the nolstalga kicks and it's well worth it due to having probably the best offline experience of any mario kart game. Without the multiplayer servers, it just isn't worth a buy. Good thing that fans have tried to do their own servers for this game and some others that had the official servers closed down because of Gamespy. I wonder how much it would cost for Nintendo to put up and maintain the old servers, on their own? I did, I got a Nintendo Life. Hey, that's the name of the website. @Franklin I think "flawed perfection" describes this game pretty well on Wii U. How else do you describe a game in two words that is better than it's original release in every way EXCEPT lacks online and multiplayer? I'm tempted to pick this up just to see it run on the big screen, get a three star ranking against CPU, time trials, play challenges, but I am saddened that there is no multiplayer support of any kind.